With a brand new, vibrant cover, discover the most exciting truth in the universe: Jesus lives! And from your heart's deepest cry to life's joyful praises, the King of kings is in them all! Knowing Jesus on a deeper, more personal level not only means seeing Him at work in your life, but also sharing your heart with the Savior. Whether you're struggling your way through a valley or reaping a bounty of blessings, Jesus is very much alive and present. The question is: Do you see Him? Do you recognize His voice? His comforting hand? His desire to fellowship with you? 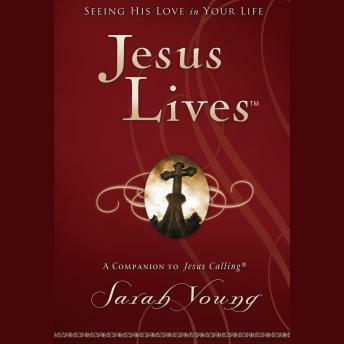 In Jesus LivesTM, 180 topical devotions exemplify Jesus' presence in your life. Through this journey, Sarah brings to light the truth of Romans 8:11: The Spirit of God, who raised Jesus from the dead, lives in you! This promise will come to life and bring new meaning as you discover that Jesus lives indeed!